Nearly everyone asked if this dress is vintage today; no, its not but I treated it as though it might have been. I bought it almost 2 years ago at a Betsey Johnson outlet store. The buttons were hanging by threads and some were even missing, there were puffed sleeves on it big enough that Anne Shirley might have even thought them a bit much. It was on sale for $50 and it was going to need work but I just couldn't pass up the scalloped detail of the trim, the prim pleats in the front or the waist-cinching tie in the back. I plunked down the money and set to work. I sewed the tiny floral detailed wooden buttons back on one by one, and it would be simple enough to wear a brooch in place of the missing one. Today I wore a bumblebee I found at a flea market this weekend. Unfortunately the dress sat in the back of my closet for a long, long time. I tried it on often enough, but I just couldn't picture myself walking into work with huge 80's puffy sleeves. It just wasn't going to happen. Finally, like a giant headsmack I realized that by taking the sleeves off and I'd end up with a stunning sleeveless dress in an eye popping color. I have been altering vintage clothes by hemming, adding and removing all sorts of things for years. New clothes go to the tailor to get fitted. It never really occurred to me to mess with the actual design of a dress I bought new until now. *EDIT: I brought it to the tailor! The extent of my sewing ends at hemming! You look absolutely beautiful--- you'd never know that the dress was less than perfect. I loved the 'card', and I can't wait for my first surprise to my new address! I really do adore you! It is a super gorgeous dress, you did well transforming it! -Hope you took before and after shots! This dress is STUNNING! I love how you altered it, and the little bee brooch is so cute and cool looking! Beautiful photos. the dress totally does look vintage. i guess its got that vintage feel. love the color! that shade of blue is my favorite! This dress is lovely- all the better for having an interesting story to go along with it! 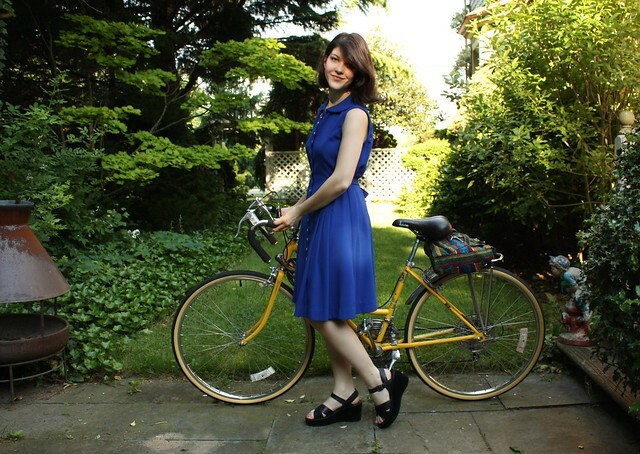 I also love the setting of these pictures with the flowery garden and bike! 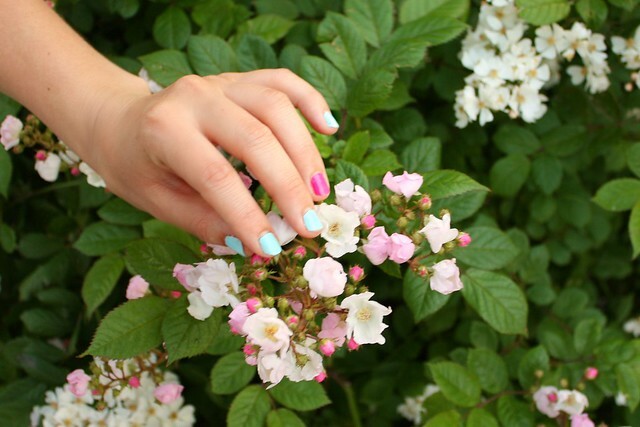 So springtime! your alterations made this dress perfect! 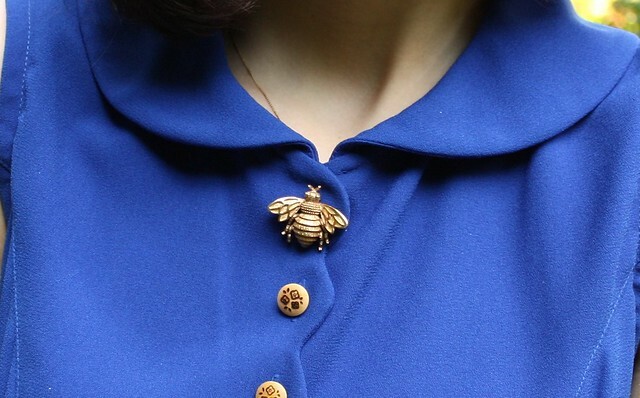 i absolutely love the little bee brooch! I love the little bee brooch! It is so cute and suits the dress well! 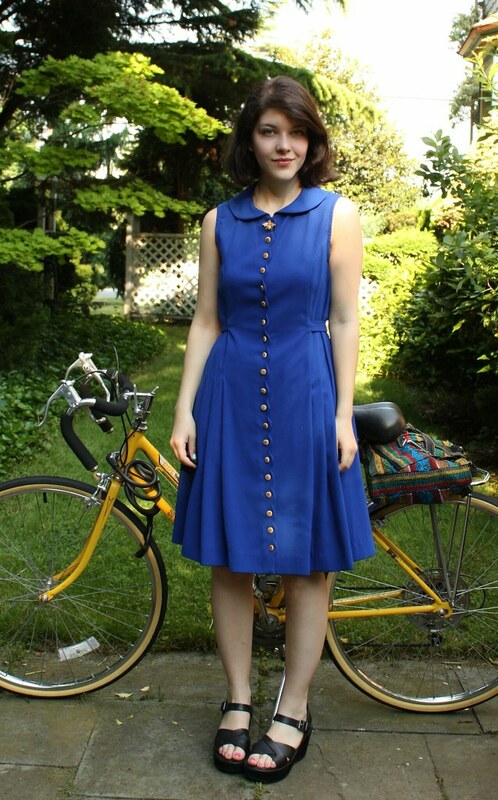 ah, this dress is perfect, and the backstory makes me a zillion percent more impressed! you did a great job, it looks perfect on you and I love these photos. you are gorgeous! That dress is absolutely gorgeous! I sooo need to get onto altering things; though my mother and grandmother seem to have skipped out on teaching me machine sewing--perhaps I'll go harrass Albert's grandma! And the bee brooch is a fantastic addition. Man, I'm actually inspired. Too bad I have to go work on my thesis now. You look wonderful! That dress is great. This dres is just gorgeous. Love the colour if it. Have you check out my current giveaway? This dress is stunning! Adore the little bug-button! That dress is a stunner! Excellent idea with the customisation. Oh my, what an amazing customization! I keep trying to imagine the huge puff sleeves and this seems to much better. 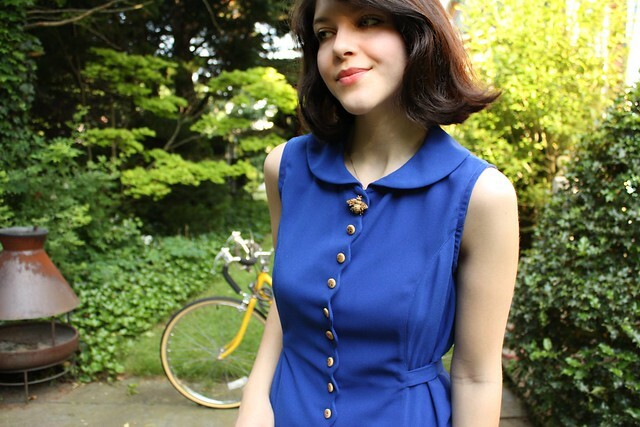 I adore the scallop trim and the colour and the way you put the brooch as a button! Lovely. I love how you totally made this your own - and it looks amazing! that dress and its colour is gorgeous and I can totally see why people would think it was vintage. You look amazing! Lovely dress! It's such a nice colour and how cute is that fly/bumblebee button. Great job you did with it. I love this dress! It looks straight from the 40s. And what a gorgeous royal blue. ooohh my god I love it. Such a good purchase even if you had to do a bunch of adjustments. It is fabulous now. the bumblebee is the most perfect touch!! that dress is so gorgeous; I love the bee! I LOVE this! Such a pretty color! I'm glad you altered it...it sounded pretty wackadoo before! Oh Betsy. My goodness, you did an excellent job transforming this dress into what it is now. Note to self: learn to sew! awww Happy Honey. . .Bee on your dress. how cool this dress is. It does look vintage. It is very very pretty!! I love the buttons and am glad you took this dress out from the back of the closet. Lovely dress!! I love the button down front and the colour is absolutely perfect on you =) Also I love your hair too! Don't know if you're a Twin Peaks fan or not, but I just realized in these photos that you look so much like the Laura Palmer character. There is actually another character who comes along in, I think the second season, Madi, who is Laura's cousin, basically the dark haired version of Lara. Anyhow, had to mention it!